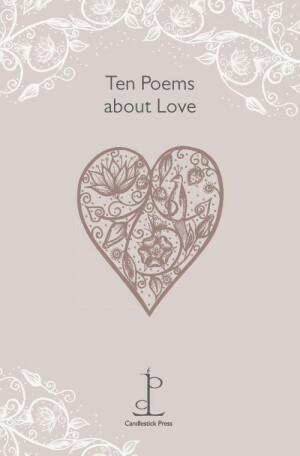 I am not normally the sort of person to think much about Valentine’s Day, but when I was given a beautifully designed pamphlet named Ten Poems about Love, I couldn’t help myself! I was given the pamphlet by Jenny Swann, a poetry lover and the woman behind Candlestick Press. Candlestick Press, a small publishing company based in Nottingham, is doing a wonderful job of making poetry enjoyable and special. Instead of a card, ten or so poems are selected on a certain theme and published in a simple and tasteful pamphlet, with a bookmark and envelope included so that you can send it to a loved one on a special day. The pamphlets are more thoughtful than a card and yet only a little more expensive. At £4.95, I would much rather spend a bit extra and not have the last minute worry of finding the perfect card. In fact, the seed of an idea was first planted in Jenny Swann’s mind when she was desperately searching the shops for a half-decent Valentine’s card for her husband. Finding only overpriced, tacky and unoriginal cards, Jenny decided that she would like to give him something more personal – something like poetry. Around that time, she was also working on a one-off poetry pamphlet for the Nottingham-based Five Leaves Publishing. The initial seed of an idea began to grow into a larger and more exciting idea. Jenny believed that if the pamphlets were packaged in the right way and displayed in the correct place, they could do very well. “I knew that they would need to be displayed like greetings cards, so that their spines would not get lost amongst the bigger poetry books”. And that is exactly how I found them when I walked into my local Waterstones before meeting Jenny. They were by the counter on a spinning display, not easy to miss and showing off the lovely and simple designs of the front covers. Candlestick Press seemed to be doing nicely, selling copies to poetry lovers and newcomers alike, but things really became exciting when Carol Ann Duffy, who had recently been elected as Poet Laureate got involved. Jenny met her at the Southwell Poetry Festival and whilst setting up her stall for the Candlestick Press poetry pamphlets, discovered that Carol Ann Duffy was a big fan. “She jumped on them as soon as she saw them!” Jenny says with a big smile, remembering the moment. 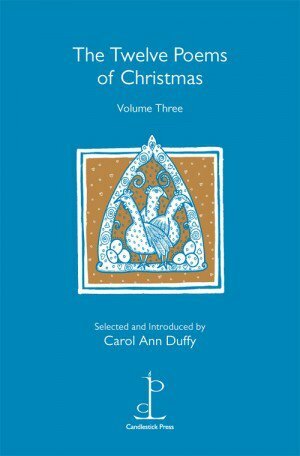 Immediately Carol Ann Duffy suggested creating a special Christmas pamphlet with poems selected by herself for every year of her laureate post. So far, there have been three editions, so we can all look forward to another seven! Jenny was “absolutely thrilled” by this opportunity which has spread the word further and generated more interest in these innovate collections of poetry. After eighteen months of running the business single handedly, Jenny thought it was about time to get some help. “When I worked at the V&A I was told that I belonged in publishing. That I had so many ideas,” she mimes the ideas sprouting out of her head, “but that I needed someone to prune my ideas back”. An image pops into my mind of an overgrown and out of control ideas tree with tangled branches, and I know exactly what she means. “That’s where Di came in. She couldn’t be more different from me.” Di Slaney became a partner of Candlestick Press in 2010. Both women studied literature, but Di took a different path, running her own business in marketing for eleven years before eventually coming back to the creative side of life and poetry. “We meet in the middle”, Jenny explains, “and we bounce ideas off each other”. So, between the two of them, and a more recent part-time publishing assistant, Rose Pearce, this small, independent publisher has flourished. I think what makes these pamphlets so popular is that they are not daunting. Jenny agrees, saying that even for her, a huge poetry lover, the sight of a big book of poems can give her a headache, especially if it’s by an unknown poet. “Nobody picks up poetry books by poets they don’t know and not many people recommend poetry”. The pamphlets are the perfect size to read in one sitting or browse through when you have a spare moment. They are something you can come back to time and again and use as a memento for a particular occasion, as a thoughtful present from a special person. “I was delighted to hear that a friend brings out the Christmas pamphlets every year, with the decorations. It is part of their Christmas tradition. I love that”. Jenny’s passion for poetry is clear, and she wants to share her love with everyone, spreading the words of poets, famous and otherwise, to people who would not normally read them – to make poetry more than just words on a page and to make it mean something. Sitting in front of her, I feel so happy that she has made her dream come true. It is so lovely to see an independent business making it in his difficult time – not because the person behind it wants to make money, but because they want to share their passion with others. I have now read five of the pamphlets, and hope to read more in the future. As a tea lover, I was very happy when Jenny turned up with Ten Poems about Tea for me! Carol Ann Duffy starts us off with a poem about her lover, getting it just right. Don’t we all know of the half-smile a cup of tea can produce? There is also some humour in the form of an energetic poem by John Agard. Or as Sophie Dahl more delicately says in the introduction, “for love and madness and everything that sandwiches in between, a cup of tea can set the world softly back to rights”. She writes about the “ritual of tea” being one she has always loved. For the British, tea certainly is a ritual, and one that I have also come to love. I would recommend this particular pamphlet to be enjoyed with your favourite cup of tea. English Breakfast for me – milk and no sugar. I can’t wait to read a copy of the Ten Poems about Puddings pamphlet with an introduction by celebrity chef Nigel Slater! My favourite poem, from all the collections that I have read, is The Chiffonier by Fleur Adcock, selected for the Ten Poems about Mothers pamphlet. It is almost impossible for me to read without feeling a tug on my heart strings. It sums up the mother-daughter relationship beautifully, and the fears we all have about the inevitable and unavoidable. At times it is sad and at times funny, but it is honest and thought provoking throughout. A shorter, but no less meaningful poem by Stevie Smith shows the love of a child for their mother. It is short and sweet and has a lovely sentiment. “Mother, I love you so. Said the child, I love you more than I know. Well, I’m glad that Mother’s Day is sorted for me this year and I won’t have to participate in the mad rush for a half-decent card! I was also glad to hear that there will soon be a pamphlet for fathers too. Other exciting projects that Jenny and the Candlestick crew are planning for the future include a range of pamphlets aimed at children. So far ideas are still being discussed, but Jenny could tell me that they will be shorter, with about 5 poems per pamphlet and that instead of the usual rectangular shape, they will be square. I am very excited to see the children’s pamphlets and can’t wait for the first publication. So, grandparents, god parents, aunties and uncles – keep an eye out for the Candlestick Press logo! If you would like to know more about Candlestick Press or buy one of these charming poetry pamphlets for a friend, take a look at their website. You can also follow Candlestick Press on Twitter. The simple cover designs are beautiful, and these are altogether an unusual and appealing idea, thank you for bringing them to my attention. I’ll certainly be looking out for the puddings one! What a lovely idea! I hate shopping for cards since I can never find a good one. I’ll have to keep this in mind! What a wonderful idea. I will need to purchase the mothers pamphlet. It sounds ideal. It is a lovely idea! I would definitely recommend Ten Poems about mothers as a gift. I already have a copy for my mum but would also like my own!